We present to your attention a light, compact tactical patrol backpack with Molle panels. The main material of the Assault Backpack KE Digital flora is a synthetic fabric, an equivalent of Cordura fabric, with a density of 900 denier with polyurethane coating. This material does not absorb water and liquid dirt, is quick and easy to clean, does not stretch, is resistant to abrasion, withstands significant gross physical effects. The backpack differs decent capacity, and the volume of the internal space can be adjusted with the help of strong lateral sling-ties. With incomplete loading, the contents will be securely fixed in any case, and the backpack itself will look compact and aesthetic. 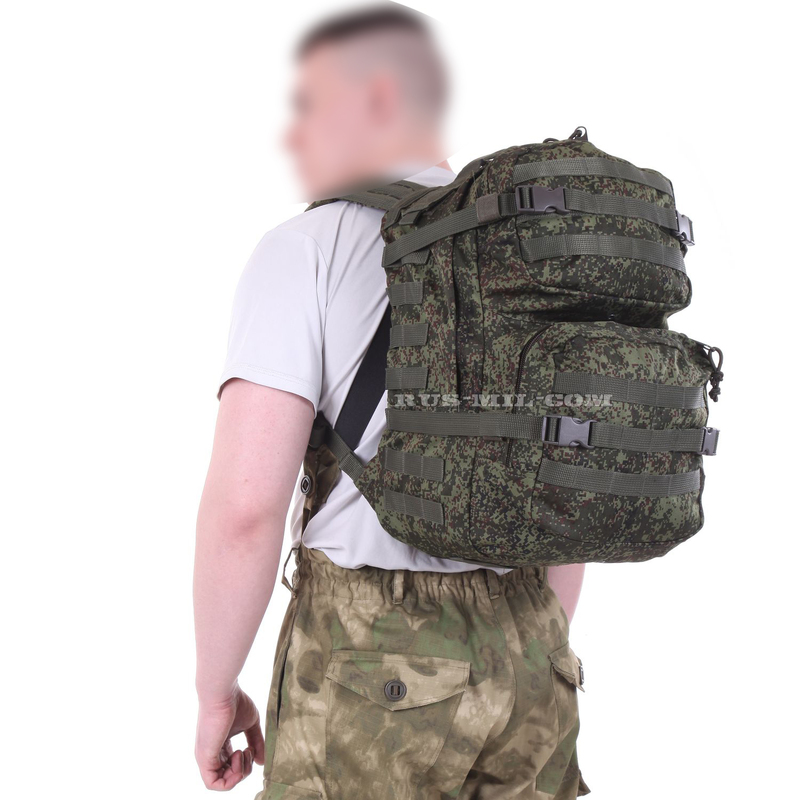 When manufacturing the Assault Backpack KE Digital flora 40l 900 den used high-quality high-strength thread, which will not lose their best properties and qualities throughout the life cycle of the product. Outside, the backpack is equipped with Molle panels. It can be hung with compatible equipment and additional pouches. The manufacturer used high-quality hardware. The backpack is equipped with a pair of shoulder straps with wide soft lining, designed to ensure a uniform distribution of the load over a large area of ​​the support. As a result, such straps do not press the shoulders, significantly delay the fatigue. Provides attachment under the belt to fix the backpack in the belt. With such a backpack, you can travel long distances or run. In active mode, the backpack is snug against the back, does not jump. On the back side, the backpack has a wall with a forming insert, on the outside this panel is decorated with a grid, designed to provide ventilation and vapor removal from the contact patch. Upper material: 100% nylon, Cordura fabric equivalent, density 900Den with PU coating 1000 mm water column. "Tortila" backpack SSO Russian specnaz original new 45l.